Come join us for an Aikido seminar with Ellis Amdur sensei and an internal strength workshop with Budd Yuhasz the weekend of April 14th. Saturday Amdur sensei will be teaching Aikido and Jo techniques. These are continuations of his past seminars at Aikido of Pittsburgh. Over the last decade, Amdur sensei has worked with several aikido instructors to develop a practice method that would lend itself to more effective atemi, counter-techniques and the development of students’ abilities in more free-style practice. All of this without compromising the essential structure of classical aikido. 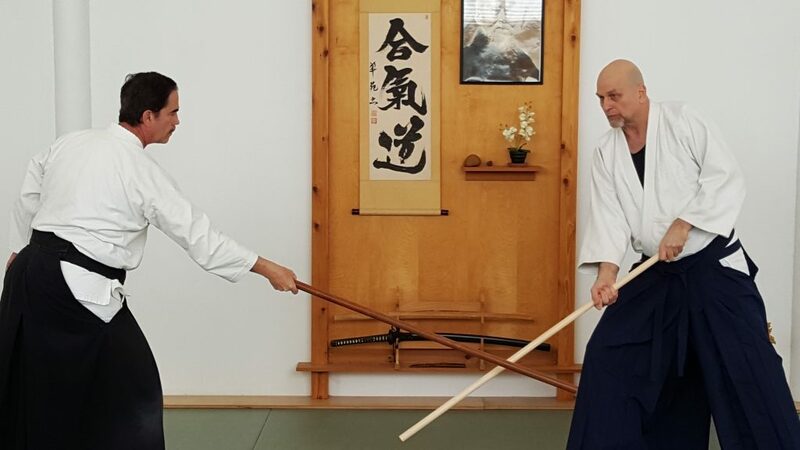 Additionally, Amdur sensei, in collaboration with Bruce Bookman sensei, has been working on Jo techniques over the past several years. Please bring a Jo for this portion. Ellis Amdur and Budd Yuhasz will facilitate an internal strength workshop to explore various practical skills and concepts around internal strength. Ellis and Budd have been working on internal strength themselves and with the guidance of Mike Sigman for years. Come learn, experiment and play with the concepts of internal strength as they are related to the practice of Aikido. The cost for the seminar is $85 for the entire weekend.